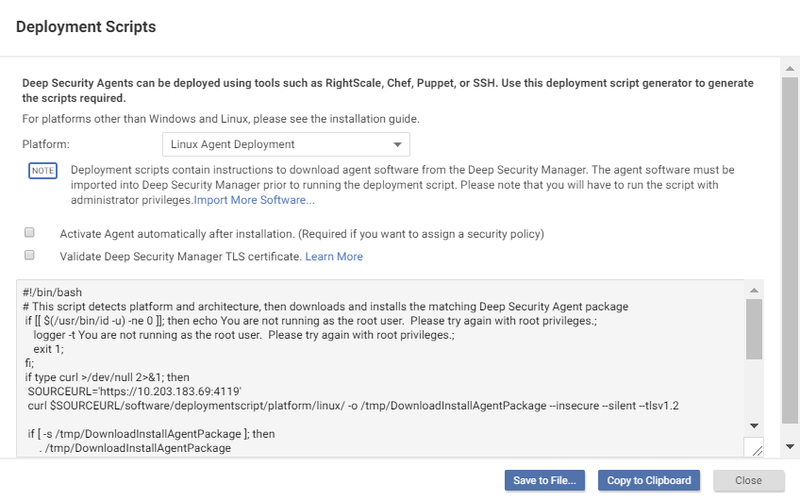 If you want to deploy an agent to an early version of Windows or Linux that doesn't include PowerShell 4.0 or curl 7.3.4 at a minimum, you'll have to use a different deployment script from the one offered through the Deep Security Manager 10.1 and above. It is provided in this article. You can't use the one in Deep Security Manager 10.1+ because it includes a --tlsv1.2 (Linux) or Tls12; (Windows) tag. This tag enforces the use of TLS 1.2 communication between agent and manager, which is not supported by older operating systems. If you want to deploy an agent to an early version of Windows or Linux that doesn't include PowerShell 4.0 or curl 7.3.4 at a minimum, you'll have to use a different deployment script from the one offered through the Deep Security Manager. This deployment script is provided in this article. You can't use the one in Deep Security Manager because it includes a --tlsv1.2 (Linux) or Tls12; (Windows) tag. This tag enforces the use of TLS 1.2 communication between agent and manager, which is not supported by older OSs. If you do not intend to enable anti-malware protection on your computers, you may want to prevent the installation of the anti-malware engine entirely. To do so, delete the string "ADDLOCAL=ALL" from the deployment script.